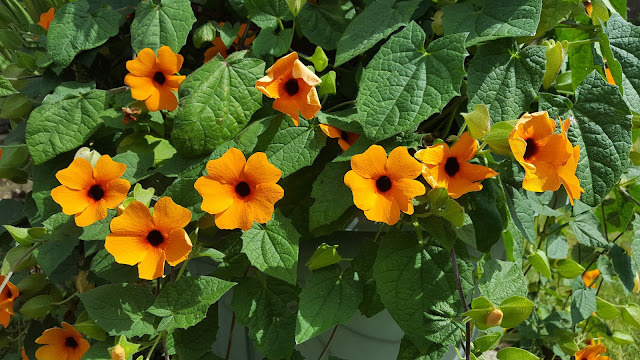 The black-eyed Susan vine - Thunbergia alata is a popular perennial annual self-twining climbing plant noted for its striking blooms. It is an easy to grow plant often grown as pot specimens or as a small climber. Native to Eastern Africa is has proven to be surprisingly tough, and despite its subtropical to tropical origins it will often overwinter viable seed in the milder regions of northern Europe such as the south of England and Ireland. That being said self-sown seeds are unlike to come into blooms until August. 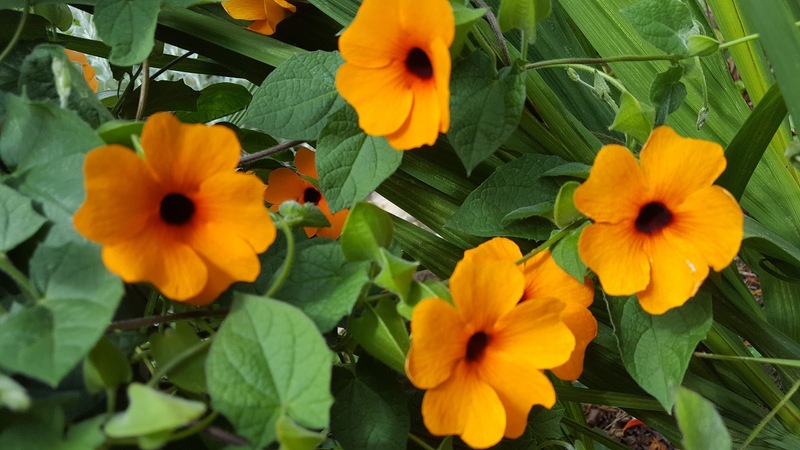 Under favourable conditions you can expect the black-eyed Susan vine to reach a height of 1.8-2.4 m although in the United Kingdom 1-2 m is more likely. The mid-green leaves are heart or arrow-shaped. The blooms, which can be up to 5 cm wide, have a flat orange-yellow corolla with a chocolate brown centre. They appear singularly from June to September from the leaf axils. The Black-Eyed Susan will perform best in an ordinary, well-drained garden soil in a sunny sheltered position. Pot grown specimens can be grown in 15-20 cm pots containing a good quality compost such as John Innes 'No.2'. Provide suitable supports such as strings, wire or canes for he tendrils to climb up. If you wish to grow them the following year then you can either over-winter the plants under frost-free protection at a temperature of 7-10 degrees Celsius or collect the seeds for sowing in March. Overwintered plants will need to be kept on just the right side of moist. They can be hardened off to outside conditions over 10-14 days once the threat of late frosts have passed. There are a number of colour variations available including red, orange, white and yellow. Depending on the selection they can also be with or without the characteristic dark centre. They are surprisingly hardy and while the parent plants won't survive, their seeds have been known to remain viable through the winter in the milder regions of southern England and Ireland. That being said when left to their own devices the soil temperature will not be warm enough for germination until June onwards and therefore flowering will not occur until the end of August.